The Gold Coast City Council engaged lahznimmo architects in association with Complete Urban to design the Helensvale Branch Library and Community Cultural Youth Centre in early 2010. The new facility is replaced an existing library and includes a 2,400m2 Library and 1,500m2 Youth Centre and performance space, along with regional Council rates offices and Councillor’s offices. This is a new type of facility for the Council that combines both a library and youth centre in a single project. The challenge was to find a strategy that would draw out the synergies between the two functions and have mutual benefit for both. 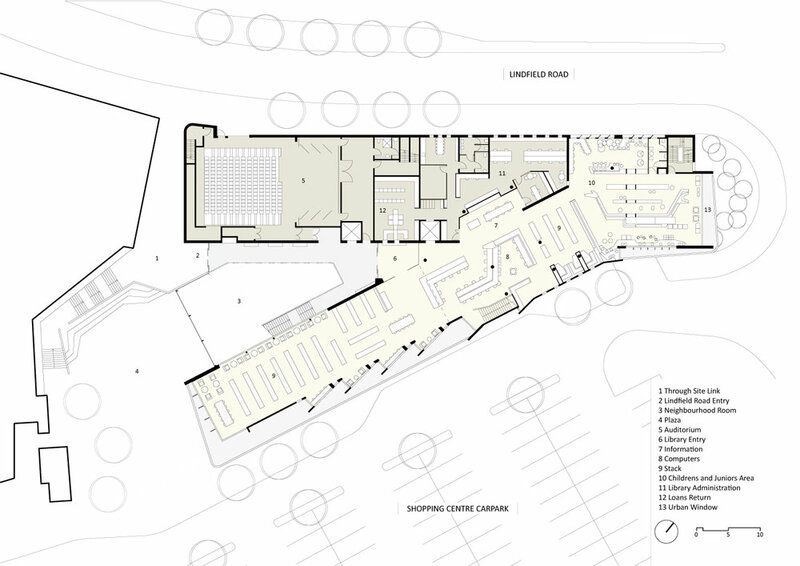 The design wraps the functions around a shared indoor Plaza called the ‘Neighbourhood Room’, which acts as an extension of the adjacent public plaza. It is an unprogrammed space that acts as entry and address for each of the building functions, whilst vertically linking the three levels.